Brush up on your singing skills while rocking out to some great music! Featuring some of the hottest bands and artists, these brilliant karaoke CDs include original artist recordings, on screen lyrics and graphics for karaoke machines, and a whole lot of fun! 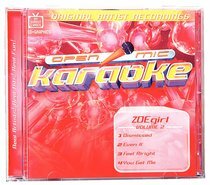 About "Karaoke Zoe Girl (Accompaniment) (Vol 2)"